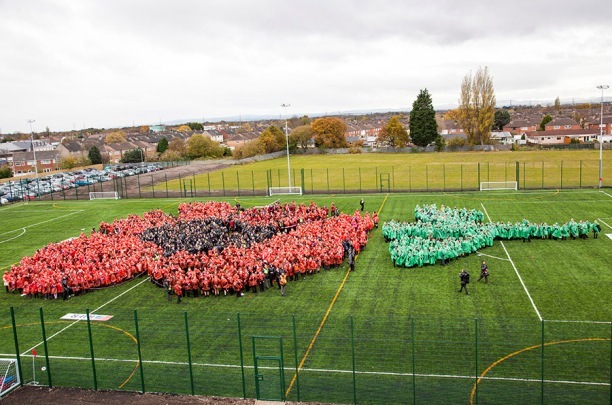 These stunning images show the moment 2,190 people came together to form a giant poppy to mark Remembrance Sunday – and enter the Guinness Book of World Records. The gathering took place on the football field at the newly opened £20m University Church of England Academy on Whitby Road at lunchtime on Friday. All Ellesmere Port’s primary schools helped, with pupils dressed in red, black and green. Money was raised for the charity Northern Lights, which helps terminally ill children visit Santa in Lapland. Ellesmere Port mayor Pat Merrick sounded the starting signal before the volunteers got in formation. Participants in the world record attempt included representatives from the Royal British Legion, Veterans Association and other community church groups. A short remembrance service took place after the record attempt. The Guinness World Record adjudicator officiated the record attempt and presented everyone with an official certificate from Guinness World Records.